Paul Street has issues with Bernie Sanders. He is not sure he could vote for the Vermont senator in November were he to win the Democratic nomination. But it’s not what you think. It’s not that Street finds Sanders too far left. Au contraire. It’s that the Vermont senator is is not far enough to the left. It just goes to show that the hoary saying is always true: You can’t please everyone. Senator Sanders has been treated by the media as a polarizing candidate, one that even many on the left see as too extreme to support. But that is not the problem for Paul Street, the author of They Rule: The 1% vs. Democracy. As someone who describes himself as a “radical socialist,” Street worries that Bernie is far too close to the entrenched power structure. Coverage of Bernie Sanders’ campaign has often focused on his self-applied socialist label. Though the word has long evoked fear in American culture—a recent Gallup survey found that 50% of Americans wouldn’t be willing to vote for a socialist—it has been making real moves into the mainstream, coinciding with the unexpected support of the Sanders candidacy for the Democratic nomination. “Socialism” was the most looked-up word in Merriam-Webster’s online dictionary for the year 2015, which the site’s editor-at-large Peter Sokolowski said was sparked shortly after Sanders’ rise in the polls in July. At a February 27 Bernie Sanders rally in New York City, above the heads of the people chanting, holding banners, and signing up for phone-bank shifts, a red and black flag — two tessellating triangles — waved proudly in the crisp city air. Astral was not alone in using the Sanders rally as a jumping off point for a discussion of true revolutionary ideology. Tom Trottier, an editor for the Socialist Appeal newsletter, attended the rally in Union Square in hopes of bringing new activists into the socialist movement. “We support the campaign of Bernie Sanders to raise the idea of socialism and raise the idea of revolution against the billionaire class. We like that,” he told WhoWhatWhy. He took issue with Sanders’ movement into the Democratic party, a political force he views as resistant to change and contrary to socialist ideals. But he nevertheless said that he would vote Democratic when it comes to Bernie, hoping that this might be the beginning of a tide of change. That is a huge shift for someone like Trottier — he said he had not voted for a mainstream candidate in any of the recent election cycles. “It’s a question of building something for the future.” Voting for Sanders as the “Lesser Evil”. Paul Street shares this view of the Sanders candidacy, as a possible jumping off point for a new socialist movement among the youth. “It certainly creates an opportunity,” he told WhoWhatWhy. But that doesn’t mean he will vote for the man. “I would seriously consider making a lesser-evil vote for the Democrats if Sanders was the nominee,” he told WhoWhatWhy. “I say that because I live in a purplish — maybe more blue than red — state [Iowa],” where a Republican candidate, including Trump, has a real shot at winning. “If I still lived in Chicago, it’d be a no brainer,” he said, meaning that there he could withhold his support for Sanders in good conscience, since deep-blue Illinois has not been heavily contested in a presidential race for years.. The question of what the word “socialism” really does mean is on the minds of many people as Sanders’ candidacy has gained traction. DiMaggio worries that the rise in support for socialism on paper is actually destructive to the true ideological force of the movement. There is some evidence of growing support for socialism among young voters. Super Tuesday exit polls showed Sanders doing markedly better than Hillary Clinton among voters aged 18-29, even in states where she beat him overall with Democratic voters. Of course, if you want to find out what millennials are thinking, check out social media. WhoWhatWhy spoke to the creator of the “Anarchists for Bernie Sanders” Facebook page (who spoke under conditions of anonymity — “even in this ‘free’ age, being pegged an anarchist doesn’t bode well for employment,” he said). Anarchists for Bernie Sanders has ballooned into a community of more than 14,000 subscribers. The founder believes it to be the largest group on Facebook critiquing Sanders from the left. Despite its name, the page is far from supportive of the senator. 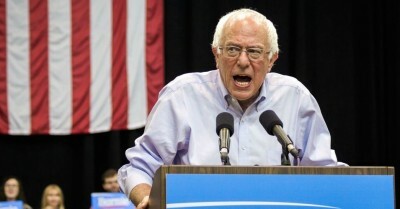 Most of the content consists of memes lampooning his claim of being a socialist or revolutionary — Sanders’s face photoshopped onto the head of a protester clashing with police in riot gear, or quotes from 18th-century French philosophe Denis Diderot, or the French political pamphlet, “The Coming Insurrection” jokingly misattributed to Sanders. The pinned post is a 1986 article bashing Sanders’ election as mayor of Burlington, VT, by the noted socialist writer Murray Bookchin, a fellow Vermont native. The founder, an Occupy Wall Street activist who had previously organized social media activity against the Keystone XL, says that the page was conceived as “95% a joke.” but he admits that it has become something more than that. To the activists who are fighting for “real” socialism, Sanders’ unexpected success so far may signal a new beginning for their movement. The feeling that the problems of the modern American capitalist system could lead to a rise in revolutionary tendencies among the populace was shared by several of the socialists reached by WhoWhatWhy. They pointed to Syriza — the radical socialist party that won control of the Greek parliament in 2014 in the midst of a debt crisis, as an example of how quickly a system can turn around in the wake of populist revolt. The founder of the “Anarchists for Bernie Sanders” page sees this moment as an important one for the history of the country and its politics, though he is worried the results will go the wrong way.